Towards the end of last year, the need for a faster Firefox release cycle was apparent, and nearly every team at Mozilla began preparing for the major changes afoot. Add-on compatibility has always been a huge barrier to releasing more often, so it was critical we have a plan that wouldn’t leave add-ons or users behind. With previous releases usually a year or more apart, we could begin compatibility outreach to developers 3 months in advance of the release, and were able to get at least 80% of the most-used Mozilla-hosted add-ons compatible with the new version. For this new system to work, we wanted a compatibility process that didn’t require developers to lift a finger unless their add-on was one of the few broken. Longer term, the Add-on SDK lets developers build restartless add-ons without worrying about compatibility hassles. AMO has made huge improvements in nearly every way since I started working on it in 2006 — design, scalability, performance, user experience, content, quality. Back then, we had a whopping 6 listed add-ons on our homepage: one featured promo block and a list of the top 5 downloads that week. 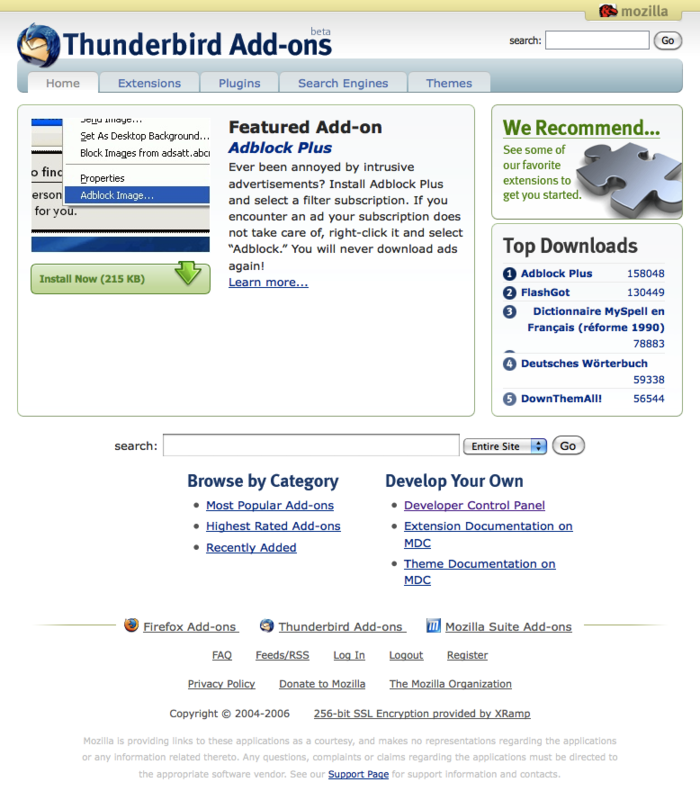 None could be installed without going to the add-on’s details page first. In contrast, today there are dozens of add-ons on the homepage and most can be installed without leaving the page. When we set out to design the new homepage, we wanted to surface more add-ons in such a way that every user would be able to see something interesting, read the details, and grab it without leaving the page. We wanted it to be easy to scan through the page and if you weren’t interested in a particular add-on, it wouldn’t take any time to skim right over it. We knew we’d probably use a hover effect to expose the additional details, but wanted to steer clear of the bad hover interactions used on many popular websites and similar galleries today. Chris Howse and I whiteboarded some mocks of an early hover interaction of a card, and began examining the ways it was insufficient. Most hover designs block scanning in one of the directions you’re trying to go (down or to the right) or, in order to avoid that, display content above and break your downward focus. The last few years, hobbies haven’t really been my thing. After getting home from work, I’d just start on a work-related side project. It’s a good way to feel productive but can easily burn you out. Running – Couch to 5K is a training program that helps you get into running by alternating running with walking. The iPhone app plays your music and tells you when to run and when to walk. I started a few months ago and have been making great, noticeable progress. Yelp – I depend on Yelp to find restaurants, doctors, car washes, dry cleaners, and pretty much everything else, but I’d never really given back and contributed to the site I find so useful. So, I decided to try becoming Yelp Elite, and am now making an effort to review every place I visit. It’s fun, and reminds me of how awesome it is to participate in a new online community. Physical Therapy – My left elbow has been a problem ever since I was a kid, and recently it’s become even weaker than it was before. I’m finally going to physical therapy to make it stronger and get back the range of motion I’ve lost. Reading – I haven’t read much since high school. Partially for lack of time, partially because I hated doing assigned reading. But the last 6 months I’ve gotten back into it, reading a bunch of comedy books from people like Chelsea Handler and Tina Fey to software and management books. The feeling of finishing the last page of a good book, closing it, and looking at the cover one more time having conquered it is hard to replicate (though I can sorta pretend to do it when finishing a book on my iPad). Learning a language – I took Spanish in middle school and Latin in high school, and remember very little of either. I’ve wanted to learn another language for a while and have been using Rosetta Stone to learn Spanish. I’ll let you know how it goes. Blogging – This one hasn’t actually started until this post. A few years ago I blogged all the time, but that eventually stopped. About once a year I’d redesign my blog and have the urge to blog again, but it always fades very quickly. My lack of blogging is due a combination of having no time for it and an odd desire to only post informative blog posts as opposed to opinions or questions. I have 7 half-written drafts dating back to 2009, and a giant list of topics to blog about. It’s time to break the silence and do something about them. Hopefully this list will continue to grow and I might eventually have something to say when someone asks what my hobbies are. Five years ago I started saving every movie ticket stub. I didn’t really have a reason, but knew I’d think of one some day. I still haven’t thought of one, but today I decided to log them in a spreadsheet and put them on a timeline. Lady GaGa’s new album, Born This Way, was officially released today. It had a few challenges that I suspect a significant portion of digital downloaders encountered. For weeks, Apple’s iTunes has been promoting the Countdown to Born This Way, featuring each of the 4 singles from the album that were released and telling fans that if they buy the singles, they can purchase the album at a discounted price using Complete My Album. Complete My Album is a great iTunes feature where single item purchases from an album reduce the price of the album. The catch? When the album launched last night on iTunes, Complete My Album wasn’t available. The albums were only available full price ($11.99 and $15.99 for the bonus track version). I was disappointed with this and did a quick Twitter search to see if others were seeing the same problem. Sure enough, I saw many tweets a minute to @iTunesMusic, @LadyGaGa, and @Interscope frustrated, confused, and in some cases even betrayed. I figured it would be resolved in a couple hours, but after checking back before bed, it still wasn’t fixed.